You’ll be safe around the lake with these guys lighting the path. October is known for many things – beautiful fall colors, cooler temperatures, and Oktoberfest, not to mention a great end to the month: Halloween! Big Bear Lake has all of these things ready and waiting for you to enjoy! We are especially excited for the cooler temperatures. They make a hike, run, or bike ride along the trails more enjoyable, and certainly more beautiful. Cooler temperatures also send subtle signals that skiing and snowboarding season is getting closer and closer. It might even be time to get your gear out and inspect it for the season. During the next week, the temperatures will slowly be sinking, and at night you may need a jacket. One more treat for the season! Spring gets all of the good press for changes in nature. Flowers bloom, babies are born, and the long cold winter gives way to warmer temperatures. But, don’t forget – fall has many charms as well. The leaves change into a blanket of brilliant, warm colors, animals are getting ready for a winter rest, and cinnamon and nutmeg come back into vogue. Nights are also a little longer, perfect for a trip to the Big Bear Alpine Zoo for a Flashlight Safari on October 12! If you cannot make it for the safari, come visit the animals on October 19 for Wolf Awareness Day! There will be activities for the kids, as well as information about wolves and how they fit into nature. The end of the month is where all of the real horrors are hiding. They have not announced it yet, but Miss Liberty plans on going out for her yearly Haunted Boat Ride on Big Bear Lake. It has been a scream every time, and you do not want to miss out. 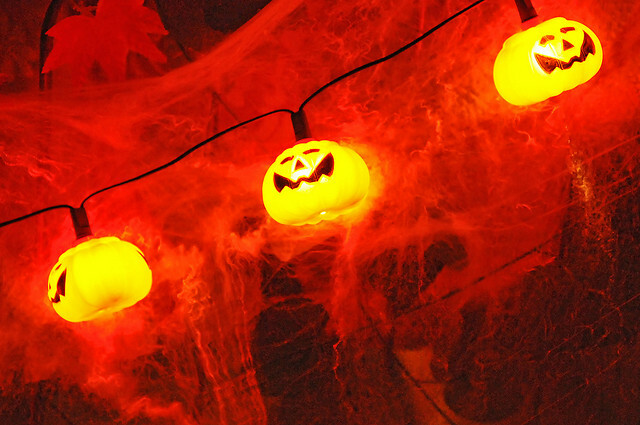 If you come up for an early weekend, Halloween will be celebrated in the Village on October 31. Many of the businesses there will have treats for your little ones, so get them dressed up and ready for the evening! The Village itself will also be decked out in all of its fall finery. You can come up the weekend before to celebrate with the residents of the Big Bear Alpine Zoo and their Boo in the Zoo, October 27. There will be special locations in the zoo for children to trick-or-treat, and they can also visit with the animals that live there. The end of Oktoberfest may be looming, but there are some great tricks that this venerable festival has in store before it ends its 2013 run. Oktoberfest Unplugged debuts this year on October 11 and 18, offering revelers the chance at a five course German meal (paired with appropriate spirits and beers) and live German music to enjoy. There are also a few other treats you get with your ticket, but you will have to see what they are for yourself! You can hear some more traditional live music at many of the other venues in the area, such as Chad’s Place, the Wolf Creek Wine Room, The Cave, and many others. There is also a musical being put on by the Big Bear Theater Project called “13”, showcasing the musical talent of thirteen local teens every weekend through October 19. There is a full slate of events in October, and you don’t want to miss them! Snow will be coming soon, so treat yourself by booking a cabin early and avoiding the rush. You can make your reservations online, or give us a call at 800-457-6401. We may even have a few treats up our sleeves over on our Facebook page. We can’t wait to see all of the great costumes that will be coming to visit us this month. We’ll even leave a jack-o-lantern lit for you out front! Gallery | This entry was posted in What to see and do and tagged Autumn, Big Bear CA, big bear lake, big bear mountain, cabins, Fall, fun, Halloween, holidays in Big Bear, Oktoberfest. Bookmark the permalink.